As an Australian, and a wanna-be writer, I have an affinity for authors Amie Kaufman and Jay Kristoff. I had also read an advanced copy of Stormdancer all the way back in 2012, so seeing Jay Kristoff’s level of success has been pleasing. It’s particularly pleasing when the collaborative novel, Illuminae, is quality reading. 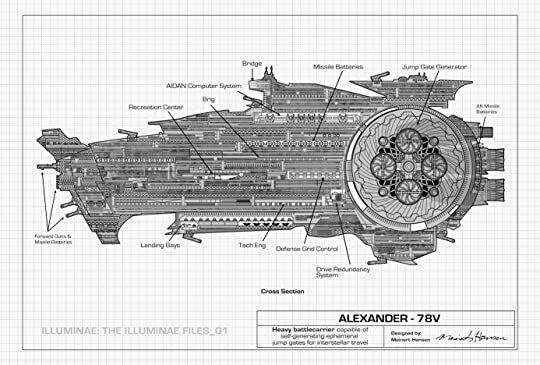 Illuminae is part-Alien, part-Bioshock and all-original content. It is the story of an invasion that separates two young teenage lovers in the year 2575. After this opening, the narrative changes tack and focuses on the politics, intrigue, and reality of imagined problems of life in space vessels. Particularly when everything that could go wrong is going wrong. The novel has a unique format similar to the meta-linguistic idea of the novel S. J.J. Abrams uses S. to tell two stories, one in footnotes and one in the regular text. However, Amie Kaufman and Jay Kristoff tell many stories through assembling their novel as a collection of assorted documents. Essentially, the narrative of Illuminae becomes a report for the hostile invasion of a mining world, in a galaxy full of multiple colonists. The documents in this report span from recorded conversations, to official battle records, to images and text retrieved from data cores. The novel becomes a uniquely interactive storyline, immersing the reader because of this format. The authors have broken the tale up across a variety of different perspectives, carefully piecing everything together into one whole vision. And that is the genius of this novel. Where it would otherwise be a story of a spaceship escaping from war, it is elevated into something greater through clever authorial decisions. Do you like science-fiction novels set in space? Have you read any of The Hunger Games, Divergent, This Mortal Coil, Mortal Engines, or The Knife of Never Letting Go? If so then I fully endorse the storytelling on offer here. However, as a word to the buyer – beware of the dangers of the piecemeal format on offer here. Stay away if you do not like collections of writing telling one whole story. Put this away if the idea of multiple documents puzzling together one consistent story confuses you. But if instead, like many readers you want an immersion in a science fiction love story? Well then, this is your next weekend read.